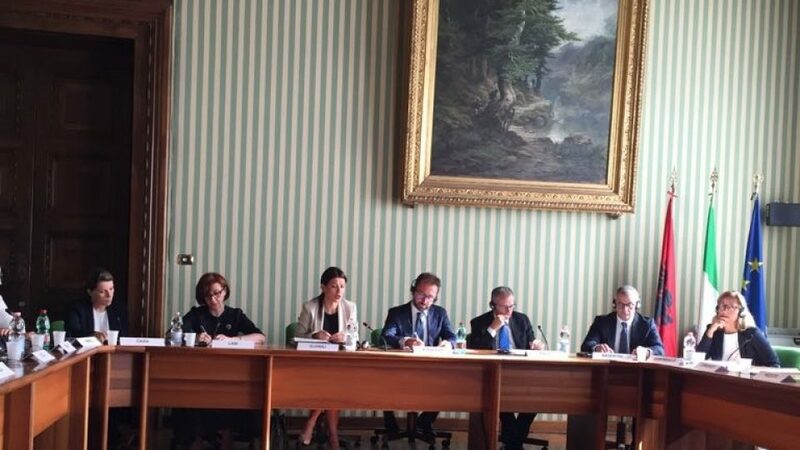 On 11 and 12 September 2018, Albanian Minister of Justice, General Prosecutor, Head of Serious Crimes Prosecution Office and other representatives from these institutions attended official meetings in Italian Ministry of Justice, National Antimafia and Antiterrorism Directorate and High Judiciary Council. In view of the establishment of the future Special Anti-Corruption Prosecution Office, the purpose of this visit was to increase the awareness of the competent Albanian authorities in relation of the future possible steps in the organization of the activity of the prosecution service in order to perform in the best way the investigation against criminal organization and corruption; to discuss concretely on the ways to improve the investigation capacities of the Albanian prosecution services. The Albanian Delegation was received by the Italian Minister of Justice Mr. Alfonso Bonafede, Chief Prosecutor of Antimafia and Antiterrorism Directorate Mr Cafiero de Raho, Mr. Riccardo Fuzio, General Prosecutor of the Supreme Court and other official representatives of these institutions. PAMECA V was represented in these meetings by Team Leader Mr Carlo D’Achille and Prosecutor LTE Mr. Carmine Pirozzoli who ensured availability of all Italian institutions to receive the Albanian Delegation and built the agenda of each meeting.